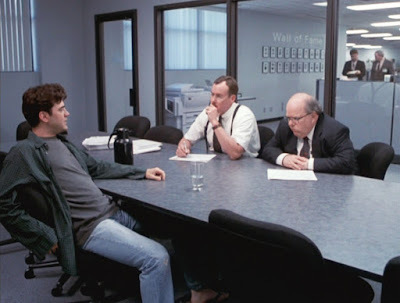 For those readers who never seen the 1990s cult classic movie Office Space, how this relates to the recent actions to make City of Elk Grove city planners public employees might not be relevant, but we will try to explain. As a comedy, Office Space focuses on the trivialities of cubicle life with its protagonist the 30-something cubicle dwelling programmer Peter Gibbons. As part of an efficiency study by employer Initech, outside consultants, affectionately known as "The Bobs" interview a hypnotized spaced-out Gibbons. During what amounted to an interview to keep his job, an uninhibited Gibbons', under the effects of hypnosis, tells The Bobs about TPS reports, and exclaims "when I have a mistake, I have eight different people coming by to tell me about it." See video below. While the employees in the Elk Grove Planning Department services do not have eight bosses like Gibbons, they do have more than one master. This situation has been a problem for this department and its directors for the last nine or so years. Since the City's 2000 incorporation as a so-called contract city, many of the functions have been performed by outside contractors. This situation, particularly in the planning department where projects are reviewed and scrutinized, created an inherent conflict of interest. The City's only contractor for planning during the last 17 years has been Pacific Municipal (PMC) Consultants and its successor, Michael Baker International. PMC's founder, Phil Carter exerted great, but a sort of sub rosa influence on the Elk Grove residents inhabit today. One of the first conflicts has been PMC acted like a law firm. Unless they are litigating or defending clients, law firms do not have billable hours, and with no billable hours, there is no cash flow. For PMC, unless dirt was moving in Elk Grove, there was limited work for more billable hours. The more dirt that was moving in Elk Grove, the greater need for Carter's crew, and hence more cash to his pocket. Like developers, Carter and PMC greased the wheels of their operations by being frequent and generous contributors to the campaign coffers of our City Council members. If developments were not in the pipeline, there would be less need for planners. The other more insidious conflict relates back to Gibbons' eight different boss scenario. While the City has employed the Planning Director, most of the subordinate planning associates were MBI/PMC employees with two separate bosses. If you think about it if entrepreneur Carter, whose primary interest is billable hours, observes that a planning director is doing their job and acting on behalf of the people, not developers, can easily sabotage that person. Not only could Carter and developers lean on Council Members if things are not going according to their standards, but Carter could also pull rank on the subordinate planners, and essentially undermine the planning director. From the perspective of Carter's planning employees at City Hall, when they were reviewed for a merit raise, who will be performing the review? If you want a pay increase from Carter, you had better please him or risk not only your raise but your employment as well. Carter, as the manager of the employees in the planning department, could give these employees instructions undercutting the Planning Director. The incentives Carter had to make sure his billable hours were growing are not unlike private sector prison operators. If there are no criminals to incarcerate, their cells are empty, and revenues fall. Carter and developers, like a private sector prison operator, is motivated to create the most punitive laws as possible so that more people are incarcerated, are driven to push the shoddiness, cheapest developments as possible. The developers won, Carter won, and the community loses, and well, as they say, two out of three ain't bad! Now that Carter's crew are presumably on their way out after the City Council agreed with City staff recommendations not to renew their contract, the City of Elk Grove can close the door on this failed experiment. Unfortunately, the damage cannot be undone - let's just hope this current City Council does not return us to those dark disastrous days. But during his reign of manipulation, exploitation, and intimidation, he still needed to have at least three willing accomplices--the City Council members themselves. So we must ask ourselves, what made him such a valuable commodity to keep around all these years? Why did his contract keep getting renewed? Follow the money trail! There are lots of ex-city employees wearing the boot print of Phil Carter on their asses, but this time around, I guess he got the boot! That's what happens when you overstay your welcome and could only muster two Council votes of support.